Carrot soup is a regular side dish in our family. After making it for so many years, I decided to change things up a little and add tahini. Now, I don’t make carrot soup without it because it tastes way more interesting than a plain carrot soup. A pinch of turmeric gives the soup a nice, bright color, and pistachios add another pop of color and texture while acting as a delicious topping. This recipe makes four servings, so you will have to blend portions of the soup since it won’t all fit into the Magic Bullet pitcher at once. You can control the texture by blending longer for a smoother, creamier soup and shorter for a thicker soup. Add the olive oil to a large pot and heat stove to medium heat. Cook the onions and garlic, stirring occasionally, in the pot for 7 minutes. Add the turmeric and stir. Add the carrots, then the vegetable broth and bring to a boil. Cook the carrots until tender, about 30 minutes, then bring to room temperature. Add the tahini and pepper and let all the ingredients in the pot cool. 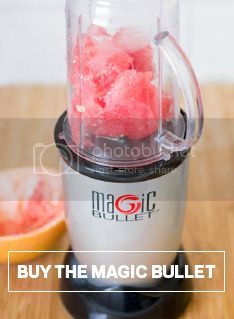 Transfer to a Magic Bullet pitcher and blend to desired texture. Add back to the pot and heat through. Add the lemon juice and stir. Serve and top with shelled pistachios.